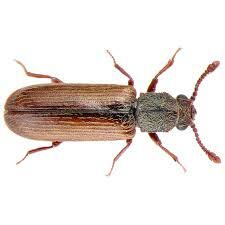 Most wood borers are actually the larvae of beetles and various kinds of moths. This occurs after the beetles or moths lay their eggs in cracks within wood or living tree tissues. The eggs develop in larvae and at this stage, the borers begin to burrow into the wood, feeding on your beams, floorboards, and even furniture. This process can occur over many years without being detected, resulting in serious structural damage to homes. In such cases, pest control treatment is required to reduce damage as well as prevent further infestation. A multiplicity of borers span the United States and the world at large. These exist within two main insect categories – beetles and moths – with the former being the more common home invader. into wood. Adult species frequently attack hardwood instead of softwood because of its high starch content. They particularly like bamboo, a favorite choice for where they lay their eggs. They also prefer wood that is very dry. 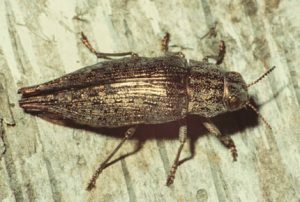 False powderpost beetles: They like hardwood as well and will make their homes in wood flooring, furniture, and paneling. Don’t be surprised if they attach oak in wine barrels as well as this is a favorite food source for false powder post species. Unlike other beetles, they can also bore into metals such as silver and lead, and sometimes make holes in the metal covering found on electric cable. Deathwatch beetles: Unlike their powder post counterparts, deathwatch beetles primarily attack softwood. They like woods that are high in moisture. Thus, they are more likely to infest basements or wood structures in homes where air conditioning or heating is inefficient. Many moth borers specialize in the infestation of trees and shrubs. Some live in forests and prefer to burrow and consume wood from declining or damaged trees. They lay their eggs in vulnerable trees – those that experience drought, sun scalding, and other injuries. The most common of these is the clearwing moth. Wood damage caused by borers has very distinct features. Borers usually make tiny round holes in wood instead of a termite’s characteristic mud tunnels. These tiny holes are used as points of exit through which they emerge as adults. Borers also leave wood powder in their wake. In the case of most beetles that infest homes, the powder is usually light in color and clump-free. Some borers do not result in serious damage to wood while the presence of others might be detrimental. For this reason, it is crucial for home owners to identify the type of borer in their home. Use the details mentioned above to identify which beetle larvae is present. If you are uncertain, get professional help. When borers damage wood structures in your home, it is best to get professional help. Pest control experts will be able to best identify the kind of insect responsible for the wood damage. They will implement treatment based on the type of borer infestation and remove damaged wood within which the borers reside. Pesticides may also be applied depending on the nature of the infestation. Where a re-infestation occurs, or other measures have proven futile, fumigation may be recommended. When it comes to wood damage in homes, borers are some of the most destructive insects. Homeowners, therefore, are best prepared when they implement precautionary measures. These may include moisture control, the installation of central heating and regularly inspecting wood to detect early signs of borers. Flying Bed Bugs: The Travel Nightmare of the Future! Online Pest Control is a participant in the Amazon Services LLC Associates Program, an affiliate advertising program designed to provide a means for sites to earn advertising fees by advertising and linking to Amazon.com.